Business ecology is a new field that synthesizes centuries of cultural wisdom, a close observation of natural systems, and proven business success strategies, such as strategic planning and total quality management. It emulates nature's systems design to provide a harmonious, relationship-oriented approach that reveals how your organization really works. 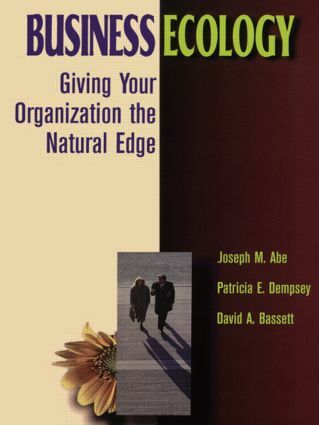 This book applies these principles to help you integrate profitability, stakeholder relations, and environmental performance ¦ giving your organization the natural edge in emerging ecological economy. Business ecology measures not just financial but overall viability by revealing vital flows and relationships that sustain your business. It is a lens for seeing those intangible elements of your organization's design -- such as core values, value-creation cycles, and innovative thinking ¦ that are essential factors shaping its success. The Business Ecology Network (BEN), founded in 1995, is a catalyst for life-sustaining enterprise. BEN is a learning community for leaders and managers who want to apply a new way of thinking ¦ business ecology ¦ to create new, sustainable opportunities for their businesses and non profit organizations. Visit the BEN web page at http://naturaledge.org.